Less filled with ‘meh’, today. Instead, I am happily covered with Kitty fur after my very snuggly Max Kitty decided it was snuggle afternoon. Awww. I am not, however, happy about the humidity today, but then again, I never am. Humidity and alyshajane’s are like oil and water – they don’t mix well! Over the weekend, the Husbitect and I visited Birkenhead Point, not so far from the Sydney CBD. We visited the newly refurbished Spotlight there and I was pleasantly surprised with the range of crafty items and how well the store was stocked and organised. They still have a few things to put out, but it was wonderful to walk around. The Husbitect mused that if we won lotto, I could spend a serious amount of money in that store. He’s right! One item I really wanted but was a tad too expensive was the ‘L Letterpress’ kit. Although after reading this review, I am feeling mighty glad we didn’t buy one now! But, what did I buy?! 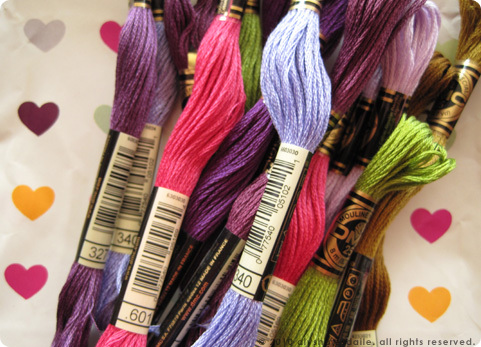 I replenished a few of my embroidery threads, DMC, in some lovely shades including some lovely purple hues. 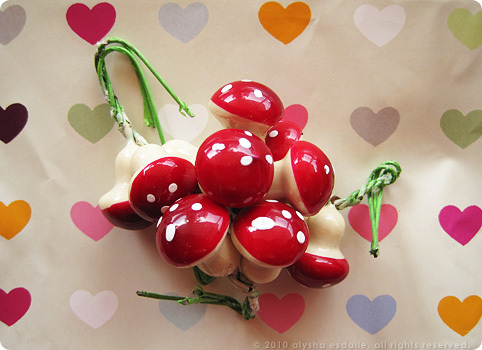 I also snapped up some of the mushroom Christmas decorations as they are far too cute for me to resist. I have a vintage, white Christmas tree and I am envisioning some decorating of the mushroom type tomorrow. I also bought some black aida material which I am going to use in some geeky, SciFi projects for the Husbitect. My other purchase was a fabulous embroidery hoop from Clover. My previous hoops were like reliable, but older, Holden cars. 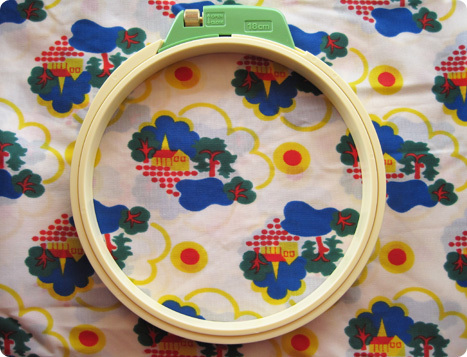 This new Clover hoop is like the Audi of the embroidery hoop world. I think so, anyhoo. Since I cannot afford an Audi, I shall enjoy my Audi-esque hoop instead. The hoop in action! Still working on my mushy embroidery! After enjoying a very delicious serve of tuna and salmon sashimi from a lovely Japanese eatery, we wandered around and happened upon the pet shop. We usually go in and have a look at the kittens, and talk of how we would love to get some and how our Maxie can be Grandad Kitty and teach them how to miaow for food, how to run around the house in the middle of the night and make the most amount of noise, and also, how to do the fluff-yourself-up crab walk! We marveled at a huge fish tank that had teensy tiny baby prawns floating around amongst the fish and agreed that another tank was one of the most lovely shapes either of us had seen. After looking at the other fish and then the birds, I spied a large cage near the door that I had glanced at when we came in, but not really taken in what was inside. I looked at the sign. SQUIRRELS. *Squeeeee! * I squeed aloud a little and ran over to see my first ever Squirrel! They were Indian Palm Squirrels and yours for the sum of $1200+ each. Unfortunately, the shop had some very noisy children playing with the squeeker toys, so the Squirrels were staying in their nesting box. But I did get to see a tiny Squirrely face peeking out! I was quite excited at finally seeing a real, live squirrel, but felt sorry for them in their tiny cage. I said ‘Squirrels’ quite a lot for the rest of the day, and told anyone who would listen about seeing Squirrels. hehe. 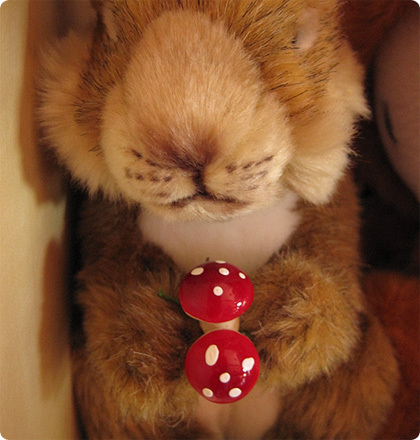 One of my softie Squirrels with some mushrooms. oh giggles, Alysha, you are totally a breath of fresh air, I love visiting you, I love reading your blog. I love your use of words. 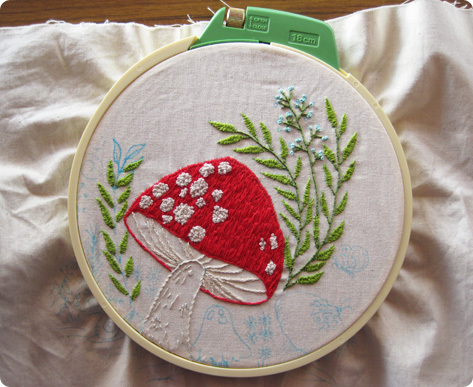 Your little mushroom is coming along beautifully, gosh, it’s just so pretty. I look forward to seeing the finished product. I do love your little mushrooms too, very cute. As for squirrels oh gosh, in a pet shop, really? I would never have thought one would be allowed to have squirrels as pets. I just learnt something new today. Have fun with your crafty goodies. Squirrels??? Here?? That seems very strange, poor squirrels. I have never seen one wither in real life. The letterset story is a very sad one, you got away with bargains with your lovely thread and I so love the embroidery hoop!!! Your mushrooms are all looking fine. We don’t have a tree per se, we have a golden wire conical thing. Labrador puppies undo their presents early and then eat them. Whatever they are. SQUIRRELS? That has completely blown my mind. I would’ve thought they were illegal or something, on account of how there are no feral ones here. Presumably the ones they sell are all fixed so they can’t reproduce?! It’s still weird though. In the US we have lots of squirrels running around outside, but I’ve never in my life heard of anyone keeping on in a cage as a pet. I think they are desexed so at least if they escape, they can’t breed. There are some feral palm Squirrels in and around Perth Zoo apparently, maybe that is why they are allowed to sell them? It does seem cruel to keep one in a cage. I’ve only ever heard of (or seen on YouTube!) people in the US keeping a ‘pet’ Squirrel when it was injured or for some reason cannot be released back into the wild. Not as a pet that was bought. Posted some more about this on your blog post about them.